In my last post, Struggling with Facebook Statuses, I outlined my frustration with the lack of control over Facebook’s status updates. Never one to complain without providing suggestions on how to alleviate the problem, I’d like to outline two proposed solutions that would allow a Facebook user to better control, and consequently, better leverage the Facebook status feature which has, for better or for worse, become a primary focus of the site with the latest redesign. Facebook could do the same for status updates. Unless otherwise specified, status updates would be seen by “Everyone”, but for more sensitive status updates, the privacy setting could be changed to include just a subset of viewers. Most casual users wouldn’t bother changing the setting, but for power users, there would be an added level of control. 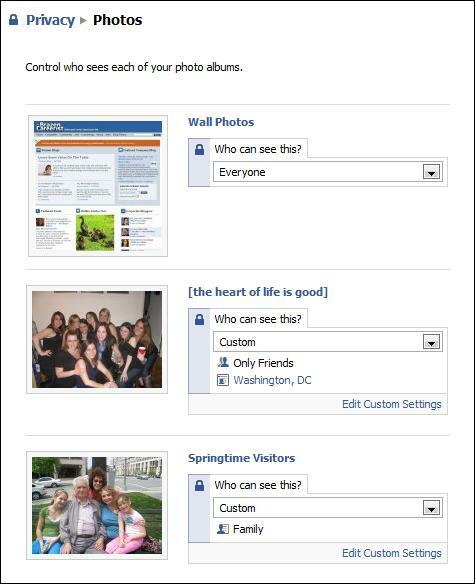 In this example, I've defined viewers of each Facebook Photo Album based on content. As it currently stands, the ability to restrict who sees Status Updates and who sees Links is controled by a single function. I believe the two should be two separate privacy functions. Firstly, Links are their own distict feature of the site, just like Notes and Photos and Events, all of which have their own privacy controls. Secondly, the reason I’d like to find a way to open up my Status Updates to more people is so that I can increase the reach of whatever information I’m trying to share. If Status Updates and Links were separate, I would keep Status Updates fairly restricted for the majority of my profile visitors. Links, on the other hand, would be viewable by everyone. I would use Links to raise awareness of — and recruit particants for — things like upcoming events. And Status Updates would remain literal, and sometimes scary, answers of “What’s on your mind?”. You are really struggling with these status update. I’ve giving in the Facebook’s Openness. There is nothing of FB that couldn’t be in the WP which takes part of the fun away from it especially if you remember the early years. That’ being said, I’m decoupling my twitter from my FB but I think it drastically reduce what I do on FB. I don’t want to give in – I want to keep part of what made Facebook what it is today! But, on a bigger level, I think this exposed a major lack of functionality on Facebook’s part. I think that we are living in a world where a site user expects (almost) complete control and customizable options. Think about how immobile Facebook is in that sense! Status of what via SMS? I don’t get it. Is it the status of whether you are online or not? Please help me understand. I would really like to be able to restrict people from receiving my status updates via SMS. Although I am putting it out there for everyone to read, I would rather it not be sent as a text message to anyone who subscribes to me. The issue isn’t even always about who is my friend that could subscribe to me – it is who that ‘friend’ forwards it to – makes it even easier to go directly to someone you ‘didn’t’ allow to be a friend. hmmmmmm…. 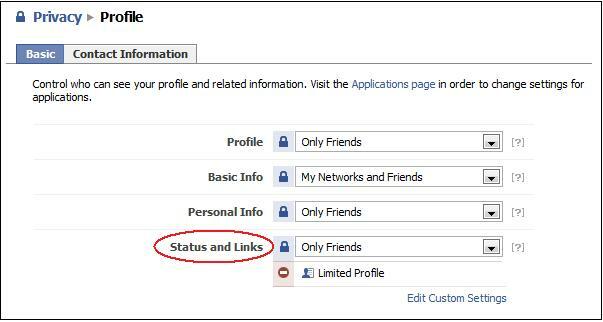 HOW DO I GET SUBSCRIBED ON MY PROFILE STATUS ON FB?